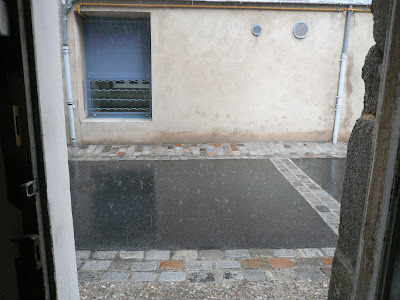 Yes, another rainy day in the Limousin! The morning - again - started out with sunshine. I got up early and was at the shop by 8.45 am. Unheard of for me! I wanted to get some paint on the windows - and still be able to shut them in the evening, and I thought I might even (why did I even think it?) paint the outside of the shop front window... ...and the shutters on the side window, which have not been painted for hundreds of years, by the look of them. 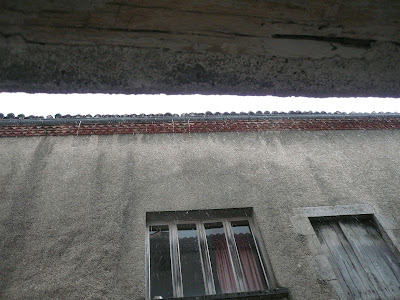 ...you can see the water pouring out of evenly-spaced holes along the guttering of the building across the street. My gutter was like this too, but I had it all replaced when the roof was done last year. So the water came down in massive drips - much harder than the rain itself (and that was pretty heavy) and bounced off the road... onto my paintwork. Ah well... c'est la vie! 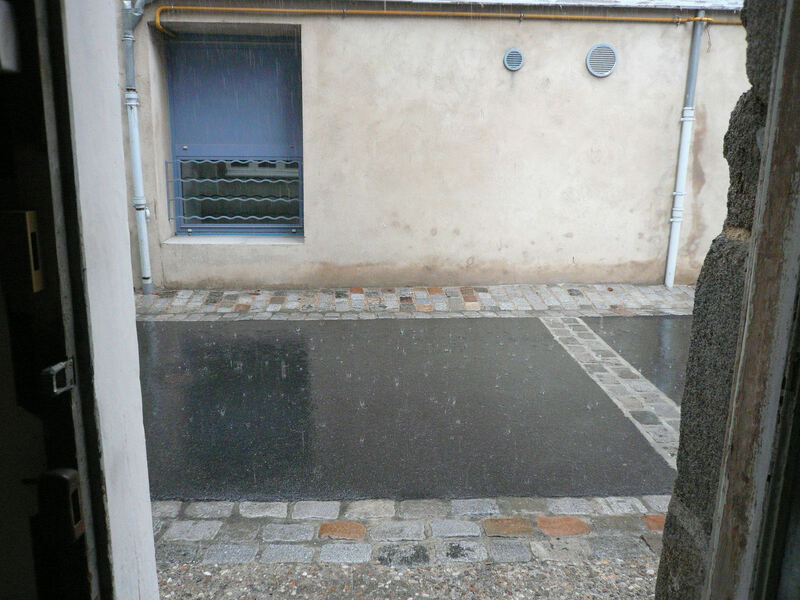 ...the wall is the side of the senior school, which has its entrance in the square - Place Charles De Gaulle. I couldn't go out any further, or I would have been drenched. As it was, the water came in under the door and I ended up rolling up dusters and wadding them under the door. Oh for a sandbag... There was thunder and lightening as well as the rain, so I just carried on painting inside and drinking coffee. I managed another coat on the stairs and the front and side windows have both had 3 coats, as has the stairs, which I think is enough, so the day wasn't really a washout - quite a lot achieved, actually. Tomorrow evening Jason arrives for a few days, but I intend to go in and paint in the morning if the weather looks promising!